“We should have come by train”, I said, as we turned into the Midland Hotel in Bradford under the old station frontage. Granted the trains stop a little short of the door these days, but still it didn’t seem in the right spirit to be arriving at a railway hotel by car. Clouds of steam and smells of hot oil and coal would have been in the air back in 1890 when the Midland Railway Company opened the doors on their showpiece hotel adjoining the new Midland Station. The complex designed by company architect Charles Trubshaw was equal to some of the finest Victorian railway buildings of the era with six platforms under a handsome iron and glass roof and spacious facilities for first and third class passengers. According to a report at the time in the Illustrated Weekly Telegraph travellers could expect the latest comforts; “the excellence of the lighting and heating arrangements … being marked”. Now all that has gone leaving the hotel on the corner looking, I thought, a little lost on its severed side without the hustle and bustle of an attendant station. Any doubts that the hotel might be a shadow of its former self were soon dispelled. Taking the side entrance we could have been passengers straight from the platform. 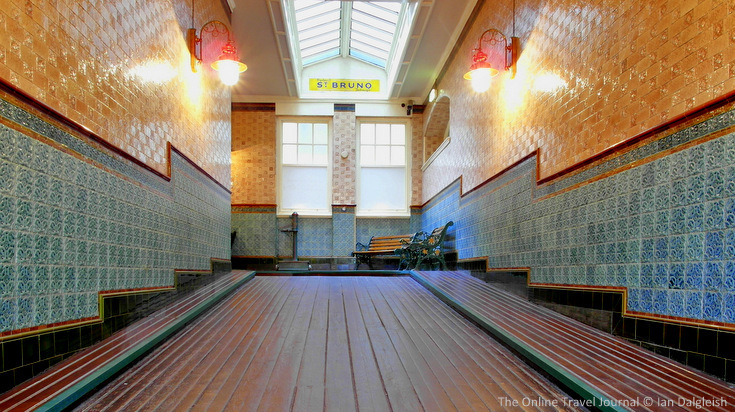 The original passage, lined from floor to ceiling with decorative yet practical tiles from the former Burmantofts works at Leeds, is a pleasing sight. A few porters pulling iron wheeled carts, heavy with leather bound luggage up the boarded incline and the scene would have been complete. 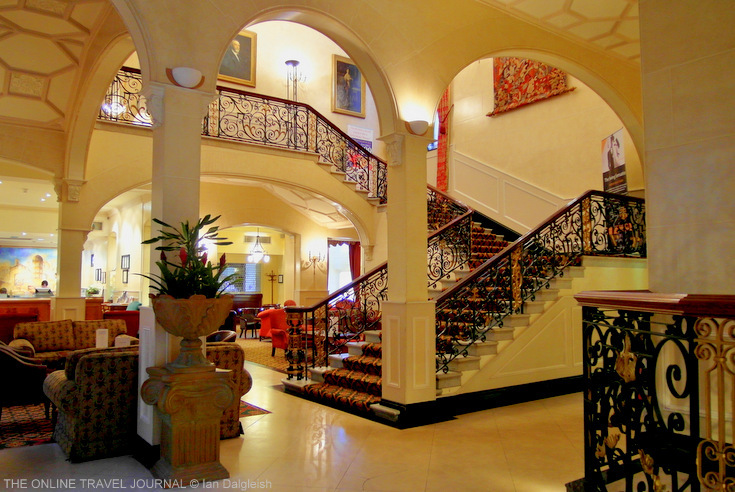 Through another door we emerged in the foyer; a splendid arched space with white marble walls and wrought iron balustrades set around a grand staircase. The style and finish recall Bradford in its heyday as one of Britain’s richest and most important cities. 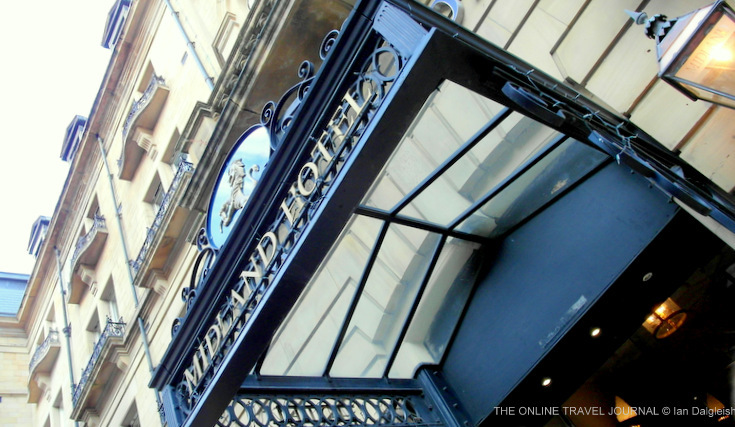 Certainly the Midland Railway Company intended their hotel to shine endowing it with two mirrored ballrooms, whose decorative plasterwork ceilings are said to rival any contemporary examples in London. Over a ‘welcome’ glass of chilled, white wine we had a chance to take in the detail and get acquainted with past guests. We were in famous company: every British prime minister to Harold, Wilson has stayed, Laurel and Hardy, the Beatles and the Rolling Stones, George Formby while he was appearing at the nearby Alhambra Theatre, most notable though was the Shakespearean actor, Sir Henry Irving, who played out his last scene here, dying on the main staircase – not a bad stage to go out on. With luggage in tow we took the lift for convenience, but for pleasure thereafter we took the stairs. Being someone who likes a well dressed window the curtains roundabout were a treat; opulent affairs with swagged pelmets, cascades and long tails lying along the carpet like a dress train. Broad corridors with thickly piled carpets led to our room at the front of the hotel. There are 90 rooms in all, furnished in a contemporary style. Our very spacious premium room came in warm shades of brown and beige that might have been oppressive in a smaller room but worked to bring the room together here. The ensuite bathroom in contrast was bright white. We had a choice of still or carbonated mineral waters and a selection of fruit, towelling robes to relax in; the mattress was good and deep and the wi-fi free, if erratic in the strength of connection. Location wise the hotel is ideal. A few minutes walking to the east brings you to Little Germany, home to the Jewish wool merchants who set up businesses here in the late 1850’s. They built some fine warehouses many of which have now been restored as homes and offices. Bradford Cathedral is nearby too. Going west you pass the old Wool Exchange, now occupied by Waterstones bookshop (do pop in for a peek at the hammer-beam ceiling) and shortly after, across a road you’ll spot the City Hall with its Gothic arches and landmark bell tower. The Film Museum, reason to come to Bradford alone, is just a bit further on again. Out and about in Bradford in the 1940′s? This marvellous mural can be found in the Spirit of Bradford Bar. Menus to tempt guests and the public have always been a feature of the hotel. When it first opened local newspapers would publish the Table D’Hote Dinner each day to whet the appetite for a light Sole Meuniere or Tarte aux cerise. The Midland Grill Bar occupying a corner spot in the building – again those high decorative ceilings and draped windows – has taken up the mantle these days serving contemporary English fare. Breakfast with a choice of full English and Continental starts at 7.30 (all there and good, rather than memorable was our verdict) followed by a lunchtime menu, an Early Bird special in the evenings and then later a choice of set or a la carte menus. Theatre goers can even split a meal, fuelling themselves with a starter and main before the show, returning for dessert and coffee after. Now having laid out all the possibilities, I must confess the Midland Grill Bar lost us to the International Tandoori – well you can’t come to Bradford without having a curry. The evening was concluded very agreeably though with a nightcap in the Foyer Bar. There is something about the whole foyer area which manages to be both handsome and comfy at the same time. Partly it is due to the good atmosphere, staff are friendly, a couple we spoke to Bradford born and infectiously enthusiastic about their city. I liked the Midland Hotel and hope one day to return. Maybe next time by train, after all there are no excuses, Forster Square Station is only a few steps along the road. The French Ballroom. Current owners Peel Hotels have done a nice job restoring the historic features of the Midland Hotel. Have you stayed in a railway hotel? Was it restored to its former glory or had it seen better days, let us know.